Supplies will be available at the township building at least the week before and coffee and donuts Saturday morning at 9 to 10 We are asking people to survey the trash they pick in order to determine its origin, WaWa, McDonalds , Coke, Heineken etc. Sponsored by: Phoenixville Tree Advisory Com. Spotted Lanternfly (Lycorma delicatula) is a new invasive insect found in southeastern PA, the only place in the US where it is known to exist. Native to parts of Asia, it was discovered in Berks County in 2014, and is slowly spreading to other counties. Spotted lanternfly feed on a wide range of plants including maple, willow, staghorn sumac, birch, grapes, and many others. They pose major threat to PA agriculture, including the grape, tree-fruit, hardwood and nursery industries. While the Penna Dept. of Agriculture and Penn State Agricultural Extension are actively looking for solutions to help stop the insects’ spread and save agricultural crops from serious damage, concerned citizens are the greatest resource for containing and controlling this potentially devastating pest. 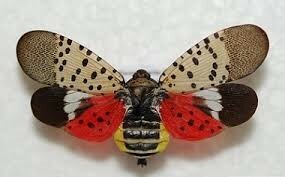 Learn about spotted lanternfly, the quarantine, and what you can do to help. This entry was posted in Announcement, EAC on June 7, 2018 by efbacon. In the case of snow on Saturday, there will still be someone at the township building to hand out supplies, coffee and donuts from 8:30 to 9:30 AM, as previously posted. There is no rain date; supplies are available now at the township building and people can pick up trash any time between now and Monday. Trash bags should be placed on the side of the road by early Monday morning so the road crew can pick them up during the day. This entry was posted in Announcement, EAC on April 5, 2018 by efbacon. Join the Great American Cleanup! Volunteer to pick up litter along our township roads. Join us Saturday Morning April 7th from 8:30 – 9:30 am at the Township Building for coffee, doughnuts & trash bags! Pick up litter along the roadside any time Saturday morning through mid-afternoon. This entry was posted in EAC on February 28, 2018 by efbacon. This entry was posted in Announcement, EAC on January 13, 2018 by efbacon.